The blocks for the latest quilt – a collection of Kaffe Fassett fabrics with a couple of striped fabrics for sashing. Laid out on my study floor. Now to assemble the blocks into a 5X7 array. 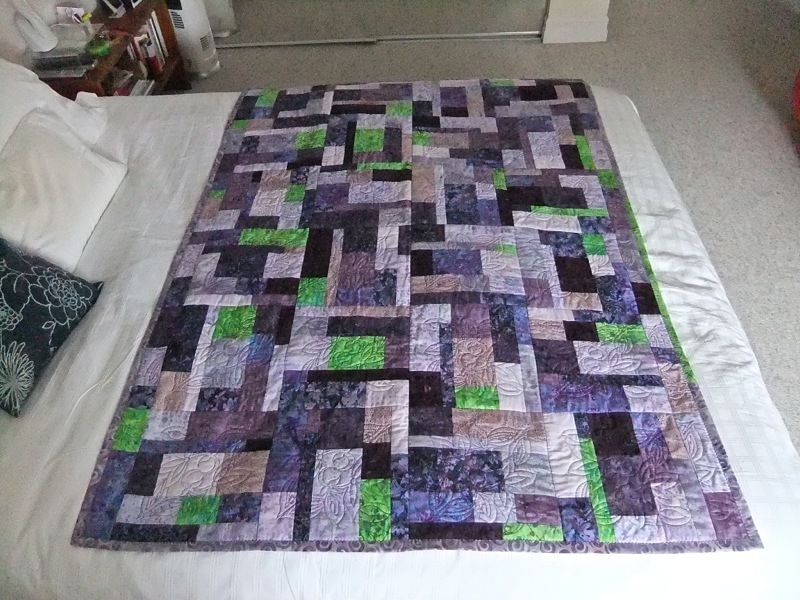 Finished the purple/mauve “low-volume tiles” quilt yesterday. I was pleased with how the whole concept worked – the color family with a single contrast color. 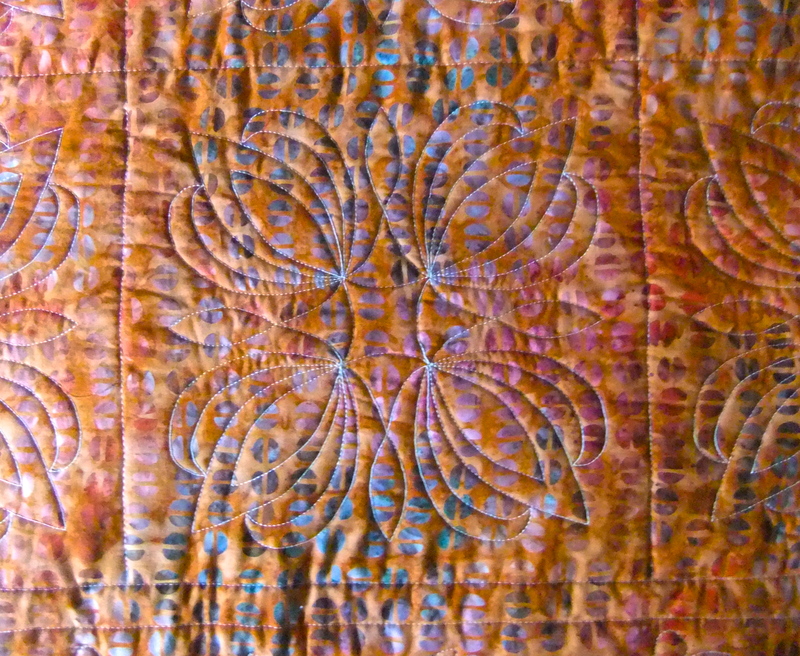 The quilting works well, too. 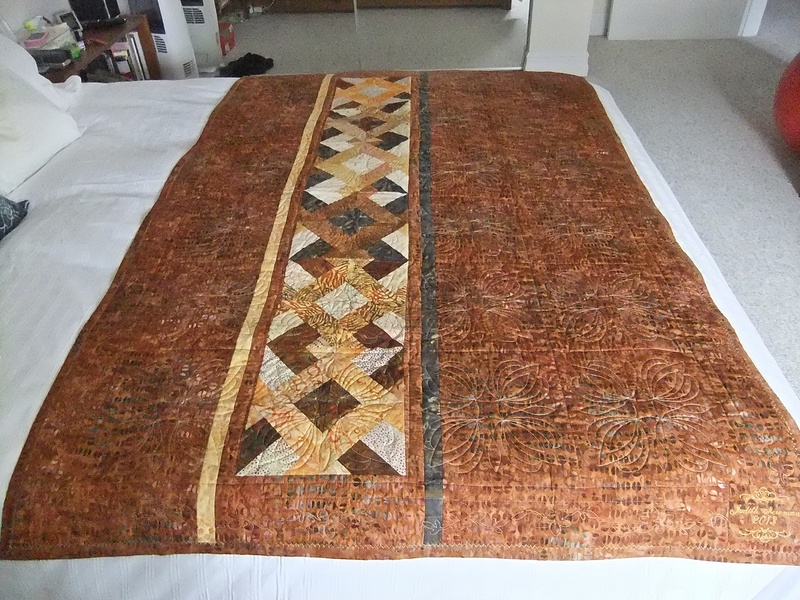 The back of the quilt – just a simple strip to extend the width of the backing fabric. Not new, but clever nevertheless. Here’s the Zeller’s Alphabet Song – can you imagine the fun the developers must have had putting this together? Another instance of stop-motion animation. My sister just sent me the following video – I wonder how long it took to make the film? 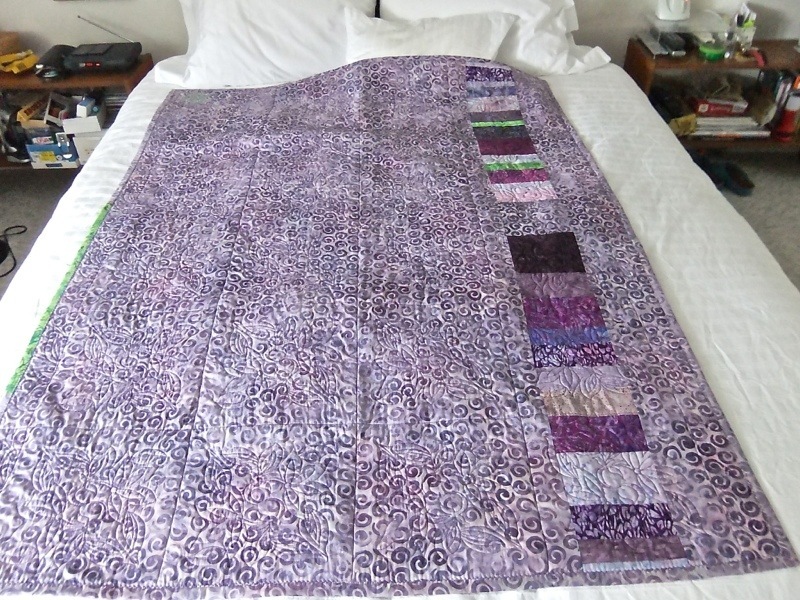 I had a “scrap bag” from Keepsake Quilting with twelve 9″ (width-of-fabric) cuts of fabric in coordinated colours. 9″ yields 4 strips @ 2 1/4″ (rather than the usual 2 1/2″) – enough to make a 44 X 62 quilt. 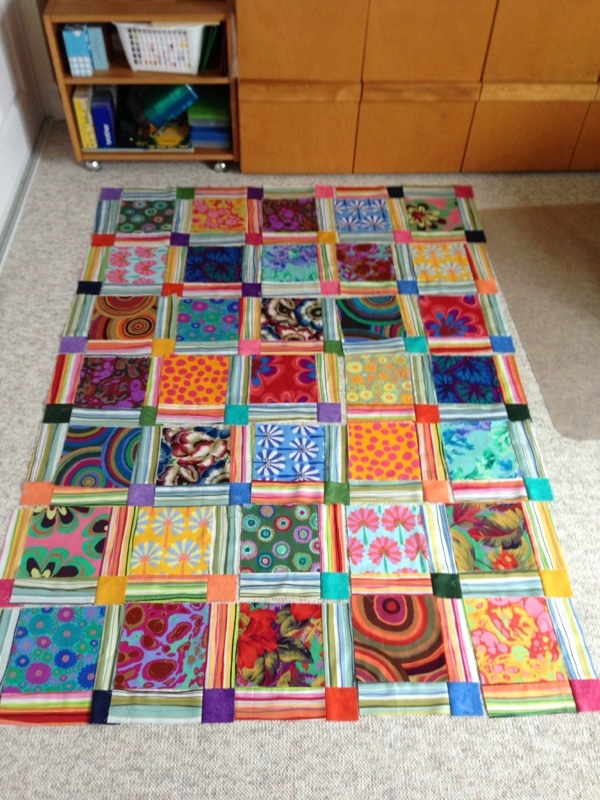 With each Magic Squares quilt I can see new possibilities – I can see at least two more ways of combining the blocks. In this version, I put together pieces from two “magic” squares so that I had the alternating light and dark center squares. The border was assembled from left over pieces from the panels made from 4 strips sewn together to make the blocks for the “magic” square. the back used the extra blocks. This time I took extra care to align the seams so that the points were accurate. The seams came out pretty well – helped by the fact that all the seam edges are bias so I could nudge the matching a wee bit, then press using Best Press to flatten out the blocks. 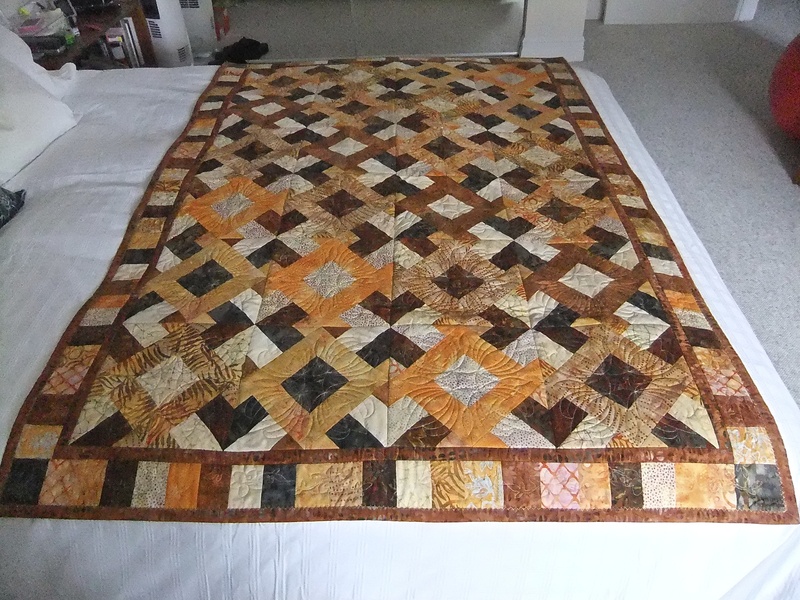 This project isn’t as easy as it looks – the piecing is straightforward, but because you sew once, cut blocks, sew two blocks together, cut along the diagonals (which creates a bias edge), sew the larger blocks from 4 “corner” blocks – the amount of cutting, sewing makes it unlikely that everything will align perfectly – so you have to take care with the seaming and cutting. 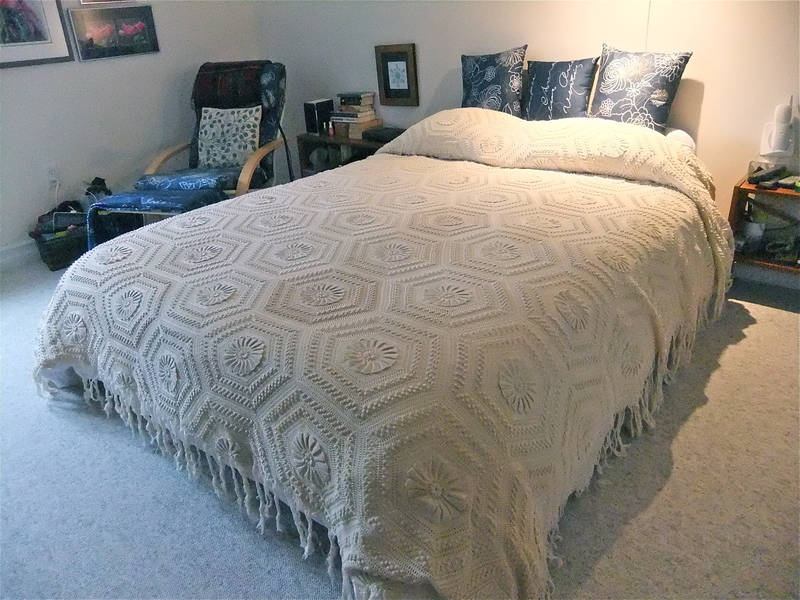 Can you imagine the work that went into this bedspread. I didn’t make it, my late Aunt Rose did. I used it for years. I still have the pattern from a crafts magazine from the 1960s when she made it. She actually made four of them – I was lucky to get one. PS: I no longer have it – it was given away in a recent purge of stuff. I still have the one crocheted for my sister Donna – it needs a new home as well.